Emails to agencies, #431 in a series of Too Many. I am not a PHP developer. I am not a Python developer. I do not hold a PhD, I am not a project manager, and I am most certainly not a MCP-qualified Windows sysadmin. Please take 30 seconds to read each CV before you email potential candidates, instead of just relying on keyword matches. All you need to do is check whether people claim any competence in the required primary skill before you send them an email, it's not bloody difficult! This is not the first time this year that I have contacted your company regarding inappropriate emails, nor is it the second. So, for the third time - take me off all of your lists, databases, etc. I do not want to hear about future 'opportunities' from you or anyone else at your company, you bunch of incompetent lazy fuckwits. PS: While you're learning to read, some of you may also wish to look into grammar-checkers for your emails. You should probably fix your broken website as well (look at the bottom of every page). I've spent most of today writing code with tears streaming down my face. This should not be taken as a comment on the quality of my code, but probably does indicate that I'm not exactly out of the depression woods just yet. In other exercise-related news, I've been trying to figure out how to install a pull-ups bar at home, but I suspect it's beyond my DIY skills. To be honest, even putting up a picture hook is beyond my DIY skills, and I'm not likely to get injured if one of those comes crashing to the ground - a pull-ups bar really wants to be solid. Might see if I can hire someone to do it once I've finished this contract I start tomorrow, as I'll have some money then. I think I'm either getting, or have been, depressed again. Notoriously, depression in oneself is always tricky to spot. In fact I'd say it's one of the main defining characteristics, that you don't realise that your emotional state is abnormal - which makes it all the more crushing. Anyway, lying in bed this morning, I realised that I didn't want to get up. Nothing new there, those who know me will grin. Well, yes, but it wasn't because I was tired... I was lying there wide awake, and almost palpably scared of getting up and facing the world. I thought about it and realised I've been this way every morning for days, at least. Maybe weeks, I don't know. Anyway, you hardly ever get to catch a glimpse of this stuff when it's happening, and so I thought I should take this opportunity to let people who know me, know. Often, afterwards, when you snap out of it or drag yourself out of it, and start talking about it, people will say "You should have said!" and you'll say "I didn't realise until it was over". This time I think I've noticed while it's still happening. As I hinted at the start, I don't know what that means about the timing - maybe the very fact that I've noticed means that it's all but over anyway. If so, great. If not... well, at least I managed to say something this time. Hopefully that'll help. Is there any way to work on improving your posture other than 'be mindful of it until it sinks in'? I had an interesting weekend last week. For reasons mostly related to my citizen journalism project Police State UK, I decided to put myself on the front line of the recent riots in Tottenham. Somewhat to my surprise, it wasn't the police who beat me up. Instead, it was half a dozen young rioters, who thought I might be an undercover policeman! (I am greatly offended by this suggestion, as you might imagine.) 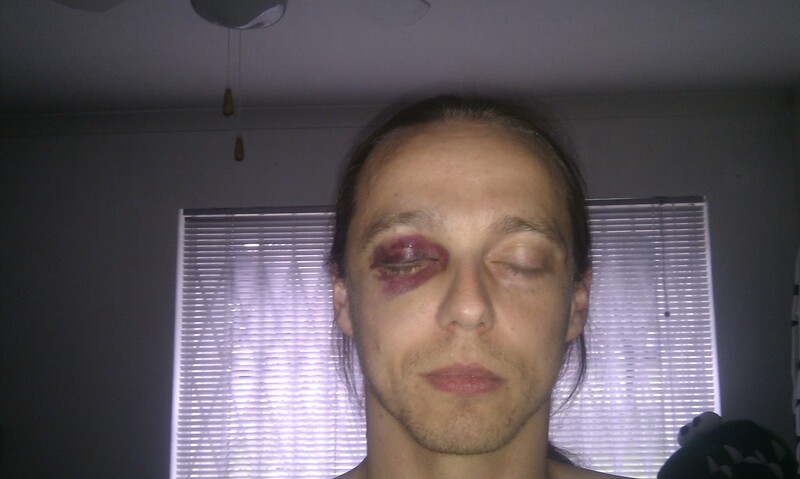 Fortunately some older wiser heads intervened, and I got out of it with nothing worse than mildly bruised ribs, badly bruised arms and right hand (from blocking kicks to the ribs, I think), and a fairly impressive black eye and bruised jaw. Legs / moar weights / time to split stuff up?